When I visit “collaborative” sites, e.g. for a team, a department or a project, I often find a document library called “Meetings”, or even worse, several document libraries, each for one particular meeting date. These generally contain documents for prereading, presentations from the meeting, agenda and minutes. And sometimes they have an action or decision list as well. The good thing is that these meeting documens are now in one clear online location, and that (hopefully) sending documents via email and printing are reduced. But now think again. It is 2013. Do you still store everything in document format, while there are ways to do thing directly online? Do you have to open multiple Meeting Minutes or Decision List documents when you are looking for that one decision from early 2012, but forgot the exact date? Is there still someone responsible for writing down “refer to next meeting” for several agenda items in the Meeting Minutes, and then remembering to add them to the next meeting agenda? Are you still emailing various draft agenda’s to your team? Does someone in your team have to collect the progress of the action list and recreate the new Action list? Do you have to chase everyone for approval of the meeting minutes? It may be time to move to a simpler process. Of course there is the Meeting Workspace, but sometimes you prefer to have everything in one site. The MW will also no longer be supported in SP2013. An alternative is the Meeting-Agenda-and-Minutes List, combining agenda, meeting minutes and decisions in one list. Our team started this in about 2002 and we have happily used it for our weekly team meeting for years. Everything you discuss is first an agenda item. The owner of the item creates and manages it themselves. All items not marked as “completed” are visible. The meeting owner adjusts the order of the agenda items just before the meeting. During the meeting, the item is discussed. We always had online meetings, so we viewed items on-screen. The item owner can adjust the item while discussing, and show the updates to the team. After discussing the item, the decision and date are added to the item and the status is set to “completed”. All completed discussions are stored in one or more “completed” views, sorted and grouped as needed. Does it sound complicated? Let me show you the (Custom) list that I have worked with. This is the item to discuss.By default, status is “New”. This is the agenda, sorted on “Order” and filtered by “Status is not equal to completed”. This is the agenda for the upcoming meeting. During the discussion, the relevant info and decision are captured in the bottom fields of the item. During discussion, the relevant information can be added. This is the view that shows all items that have been discussed. You can easily filter for specific topics, regardless of meeting date. Of course you can also group on other metadata, but this view clearly shows the increased transparancy compared to Meeting Minutes in document format. All decisions from earlier meetings, grouped by discussion date. Of course you can simplify or extend the list to fit your own meeting style and goals. No need to send agendas via email; if everyone sets a notification you wil get a message when a new item has been added or changed. When something is not discussed or no decision has taken place, it simply stays on the list. You do not have to specifically state that it is “moved to the next meeting”. One archive of individual decisions means you do not have to look through documents by date. Now that you have one “online database” it is much easier to find any decisions relating to your topic, since they can be found by date AND by creator AND by tag if you have used those. Everyone has seen the decision so there is no need to circulate any meeting minutes for approval. Will this work for all meetings? Of course this needs change management. If your organization is relying heavily on documents, not used to PC’s and projectors in the meeting room, or has been pampered by people sending things to them, this will be a big change that will need discussion, training and an extensive trial period. It may be wise to measure time involved in the current meeting setup beforehand and to compare that to the new setup. This information will also help you to convince others. For some meeting types this setup may not be appropriate. There may be legal requirements to have documents, perhaps even printed, with handwritten signatures, or some external participants may not have access to your SharePoint environment. But for your average team, department or project group meeting, this may save lots of time! Have you used something similar? Please share! 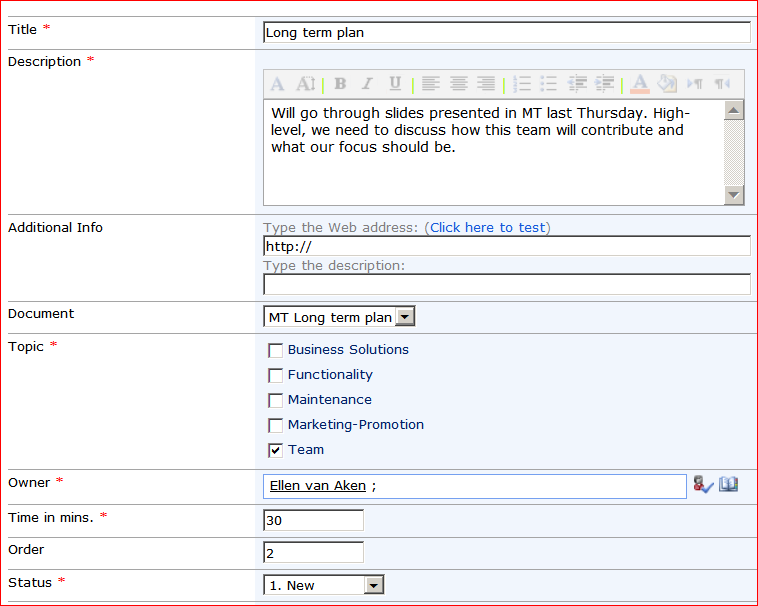 Note April 2013: Gene Vangampelaere shares his use of OneNote for meetings. Nice! Oh good – our upgrade budget has been cancelled! So, there is a new version of SharePoint coming up, so you may be thinking about moving to the latest version. But there’s an economic crisis going on, so your budget may be under attack. In any case, I expect some very interesting discussions will take place in many organizations. But if your management decides not to spend money at this time, please do not despair! There may be other opportunities to improve your intranet. About eighteen months after the launch of our SharePoint intranet we started with preparations for the new version. We attended a demo of the new features, discussed how these matched the needs of our users and made a preliminary time schedule. Of course I was looking forward to the adrenaline that “a new intranet” brings, such as the creation of a communications plan, doing road shows and late-night functionality testing….not to mention the excitement of the actual launch day! On the other hand, I knew very well that many users still had problems with SharePoint. Even our most ardent publishers of our previous, custom-built intranet were struggling with content management in SharePoint. Would it be a good idea to confront them so soon with even more new functionality? My more technical colleagues did not share my fears. As soon as we had incorporated our ideas in our annual plan, and had distributed the draft planning to the rest of the team, we received a corporate message that all budgets for next year had been frozen. Not only did we have to cancel our plans, but our in-house developer/support team had to leave as well! All support and development would be using the normal process that also applied to other systems: completing forms, waiting until someone else decided on the priority, defending your request and fingers crossed that our support partner would know how to maintain our SharePoint environment because that was not their expertise. (Not to mention the amount of customization we had done). And if you’re used to a few wiz kids in your team, who understand you with half a word, and who have located, if not solved, almost every issue within 5 minutes, it is difficult to accept the bureaucratic route. My more technical colleagues were devastated. Secretly I was a little relieved, because the delay meant that our end users were getting more time to get used to the existing platform. So I tried to keep a positive spirit in the team. We allowed everyone one day for expressing frustration and grumbling. The next day we looked for positive aspects of the new situation. And guess what…there were many! Because of our focus on new technical developments, we had neglected some other aspects of intranet management. We could give attention to those aspects without any extra budget and with the remaining resources. With the last part of our own development budget, our developers made some small application and modifications that we had never given priority before. We made reprints of our Team Site manual with the remains of our promotion budget, and our designer created a new guide for the External Team Sites in her last weeks with us. All technical specifications, use cases, process descriptions, configurations, special code and other technical and system stuff that I do not know much about, were collected from various sources, evaluated and stored in a Team Site, for transfer to the service partner. We created a maintenance schedule to clean up empty or neglected Team Sites and other content types on a regular basis. A Team Site Calendar was perfect to store frequency, process and communication for each content-type. We replaced our labour-intensive monthly html-based newsletter by a blog. We started creating personas. That would be taking a long time, so the longer we could think about those, the better. We organized training for new users. We organized a classroom training for new employees on our location, and a Live Meeting session (live or recording) for everyone else. This has the unexpected benefit of getting to know our new employees from the start…and they knew us which was even better! We created a central configuration team (our Business Solutions, who created the DMWS-Examples), to help the business use their SharePoint environment as good as possible. My more technical colleagues finally saw the advantages of the situation. And the business was pleased with our training sessions and our Business Solutions Service. Sometimes it is good to not just upgrade to the new version just “because you can”. If you keep focussing on having the latest version of your intranet platform, you may never get around to doing other things to improve your intranet. If your budget gets cancelled, think how much time you will have to spend to improve your intranet in other ways! Next to that, we learned to enjoy the challenge of introducing new activities on a low budget. Have you experienced an unexpected budget constraint? How have you dealt with that? Although this example is actually about Live Meeting/Lync and not about SharePoint, is does illustrate my point that you can do more with your existing toolset than you think! One of our content experts needed to train about 150 people across Europe. She had always visited each country when there were a few people who needed training, but she was now looking for an option that would save time and money. An official e-learning module was rather expensive, especially if it was for only 150 people. Also, only an external person would be able to make adjustments to the module afterwards. And she did not need all the functionalities of a dedicated Learning Management System (LMS). So we had to think of another way to meet her needs. We decided to use PowerPoint, a Team Site and a standard Live Meeting (web conferencing) with poll and recording functionalities. 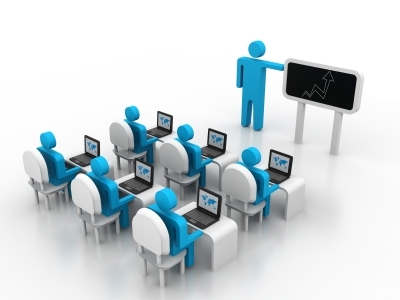 The PowerPoint, the training schedule and the recording were stored in a Team Site, along with other content on the topic. All trainees can easily access the training, since there were no password barriers. Doing the training via Live Meeting enables her to have personal interaction with all attendees. This would not have been possible with an e-learning module. The interaction and discussions are much richer than in her one-country-trainings, since every session attracts attendees from different countries. New employees have a faster learning curve because they can watch the recording as soon as they need it. Giving this training several times, and analyzing the poll results, allows her to continuously and quickly adjust the training to the needs of the audience. She can make any changes herself – it just needs an update in the presentation and a new recording. So, once again it shows you do not always need a lot of fancy new shiny software to be able to meet your business goals! Check what you already have at your disposal, use your creativity and off you go! Do you have a good example of using web conferencing? Please share it! Image courtesy of jscreationzs at FreeDigitalPhotos.net.